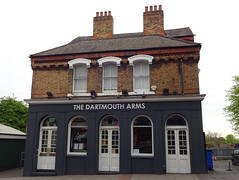 Gastropub in Forest Hill, run by the same people as the Dolphin in Sydenham and the Duke in Deptford. Entry is into a long narrow room with a flatscreen at the end and a couple of upright armchairs as well as normal chairs and tables. Up a step from here is a small room with a couple of seats and a section of bar with three handpumps. A small lobby to the side here leads to a courtyard-style beer garden. Finally, at the back is a restaurant area, with an open kitchen visible behind the bar; a skylight here provides natural light, and the walls are hung with art for sale by local artists. On our September 2012 visit, this area was mostly pre-set with cutlery and napkins, though there were a few tables left free for drinkers. Table service was offered for both food and drinks (we're not actually sure if you can order food at the bar or if you have to order from waitstaff). Kake, bob, and Alice visited on a Monday evening in September 2012. There were three real ales on: Doom Bar (£3.40/pint), London Pride (£3.70/pint), and Timothy Taylor Landlord (£3.80/pint). A pint of lime and soda was a fairly astonishing £2.75, though it did come with a small shot glass full of complimentary salted peanuts. There were quite a few other customers at 6:30pm, though many of them were in the garden and ther were still plenty of free tables inside. Music was playing, not too loud. According to their website as of September 2012, food is served noon-3:30pm and 6:30pm-10pm Mon-Fri, noon-10pm Sat, and 12:30pm-4pm (Sunday roasts) and 5pm-9pm Sun. The style is gastropub-done-well photo of menu as of September 2012. Kake's starter of smoked mackerel pate with shallot/caper/parsley salad and melba toast (£6.50) photo was well-executed and beautifully presented. The pate was nicely smooth, the toast was perfectly crisp, and the salad was the perfect complement. bob's deep-fried squid rings with lime and chilli mayonnaise (£6) photo were also good; crisp, not greasy, and not overcooked (after trying them, he regretted not choosing the larger portion at £8.50 as a main course). Alice's main of pan fried salmon with crayfish/pea/tarragon risotto (£12.50) photo was again nicely presented, and the fish was just the way she liked it. bob's beer battered haddock fillet with chips, mushy peas, and tartar sauce (£10.50) photo came with some absolutely delicious peas; they weren't actually mushy peas, which should be made with dried peas, but rather herbed crushed fresh peas, which worked really well. The chips were a bit soggy and greasy though — chip-shop style — and it wasn't clear whether this was on purpose. Kake's barnsley chop with cannellini bean and caper salad (£11.50) photo had a well-sourced and well-cooked chop, but the beans were rather too salty (though not badly enough to send the dish back). Kake's verdict: I'd probably come back for more food. If it wasn't for the exorbitant pricing of the lime and soda, that would be a definitely. Accessibility: Two steps to get in, with a grab bar handily situated beside. Another step to get to the back seating area, the toilets, and one of the tables in the beer garden. More steps to the rest of the beer garden. There is a ramp at one side that would provide step-free access to bar, seating, and toilets, but it's not clear if this is in use. Last visited by Kake, bob, and Alice, September 2012. Opening hours taken from the Dartmouth Arms website, September 2012. Last edited 2017-04-23 16:47:14 (version 12; diff). List all versions. Page last edited 2017-04-23 16:47:14 (version 12).